We all know the story of The Libertines - Doherty's drugs, Barat's dismay - and most of us have been a bit sad that they've not been together for the past 6 years, however, this reunion gig was amazing. The boys ran through most of their back catalogue and did a wonderful job. There was hugs, kisses and smiles aplenty and the crowd really went wild. There's just something so alluring about that band. Maybe, in a perverse kind of way, I'm attracted to the heroin-chic glamour of it all. I'm certainly attracted to the great music they made. Maybe it's because when I was 16 they were the best band around. The Libertines, to me, are just a real, proper rock 'n' roll band. At one point, during Time for Heroes, it all got too much for the audience who surged forward and caused a bit of a commotion, but this was just 80,000 people's sheer elation at seeing these guys performing together again. This was an absolute beauty of a performance and I'm very pleased they're back together again. I just hope they're going to tour after this and if they are I shall be watching by hook or by crook! With iPods, x amount of compilation 2cd, genre specific sets and all manner of online listening tools such as youtube and spotify, one has to wonder: is the album going to die? Probably not, but I do fear that people look at their iPods and only see the 'shuffle' option. Your iPod has an 'albums' option as well, so why no sit and listen to one of the albums on there. It's very enjoyable. The other problem, I suppose, is iTunes itself. Today's listener has the option to cherry pick his/her favourite tracks off an album and leave the ones they don't know. That is a big worry. I know this is a much debated discourse, however, it's something I feel strongly about and the 2 or 3 people that happen to bother to read this (in-between flicking through 'songs' on their iPod probably) may just take something from it. I hope, anyway. Here's FotB about places around the Globe... enjoy! The Clash - Spanish Bombs: 'twould be wrong of me not to include this as it's one of my favourite ever tracks. I couldn't lavish enough superlatives on it! Ultravox - Vienna: A fantastic song, the high point of Midge Ure's recording career. Shame Geldof was such an arse and ran off with Bono. Morrissey - I'm Throwing my Arms Around Paris: Mozza's latest offering in single format (excuse the pun) is a treasure. He just doesn't stop. Led Zeppelin - Kashmir: The greatest riff ever? It might not even be Led Zep's actually when you think of Whole Lotta Love. A stunning track none the same and the Puff Daddy version with Jimmy Page wasn't too shabby either. Sam Cooke - Meet Me at Mary's Place: This could well be a fictional place, whatever, I couldn't resist, it's an absolute choon! Right, just a quick post to say that anybody who happens to stumble upon this should first, finish reading the whole blog, I assure you it's very good and then nip over to youtube and watch this documentary. Especially if you are one of those people who fails to see the humour and life affirming qualities in this man's lyrics and instead just dismiss him as 'miserable'. It was aired yonks ago on Channel 4 over here in the U.K. but is bloody brilliant. I highly recommend it! By seeing him and getting a touch closer (though nowhere near close due to his evasiveness) to how Mozza really is, you may be inspired to listen again. For those of you who don't just think everything he does is a bore and miserable, well, you'll bleeding love it! This book is an absolute triumph! 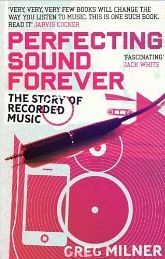 Milner takes the reader through the history of recorded sound starting in 1877 and Thomas A. Edison's invention of the phonograph and ending up with today's recording techniques such as Pro Tools via Phil Spector, King Tubby, Steve Albini and many others. This book is very well researched. Milner gives wonderful insight into the great debates in music recording such as the analog/digital debate, the acoustic/electrical recording debate and the loudness war and dynamic range compression. This book has many attributes but its main strength is in its balance in arguments. Milner provides both sides of the arguments involved in the story, giving eyewitness accounts from both sides in the aforementioned debates. The analog/digital debate especially opens up some wonderful discoveries. Milner uses scientific fact partnered with useful insight into the way humans take in music timbrally and also gives us dates, times and events for a historical account with added character in the writing. For anybody who feels they love recorded music, this book is a must. It's probably the most interesting thing you'll read on the subject.